The draft resolution was supported by five nations, four member states voted against. UN, April 11. /TASS/. 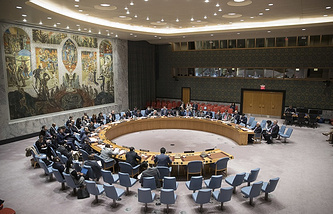 A compromise draft resolution, prepared by Sweden and supported by Russia, on the purported chemical attack in Syria’s Douma was turned down by the UN Security Council on Tuesday. The draft resolution was supported by five nations, including Sweden and Russia. Four member states, including the United States and the United Kingdom, voted against. Six nations abstained. 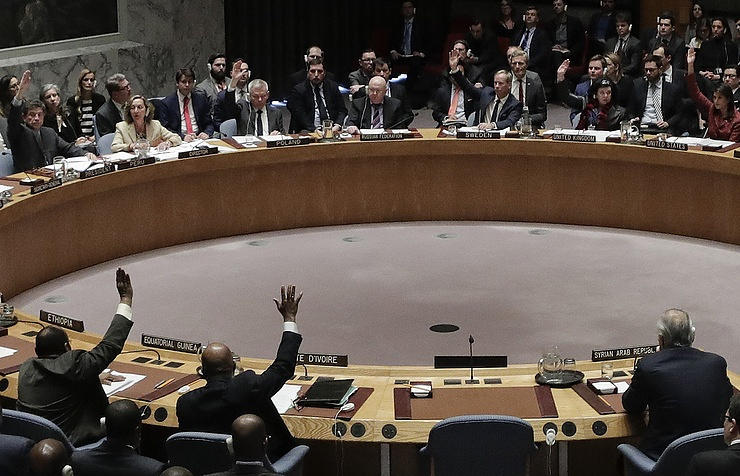 Russia’s UN envoy Vasily Nebenzya said the move to reject the compromise draft resolution was "alarming." "Regretfully, the rejection of this resolution is an indicator that shows a lot. This is very alarming for us," he said. "We came up with an absolutely innocent resolution, which, on top of that, was almost equal to yesterday’s [resolution] by Sweden." The United States spoke against Russia’s draft resolution on Syria because it allegedly puts the independence of the investigation into question. A similar point of view was expressed by UK envoy Karen Pierce.